Method 1: From your phone’s Settings you’ll have to access the option Manage Applications. There you’ll find a list with all the applications installed on your device, both those that you’ve downloaded yourself and those that were already installed on the phone. Browse through the list until you find Aptoide (it’s usually in alphabetical order so it won’t take you too long) and tap its icon. You’ll access a menu with detailed information about the application (size, cache memory, permissions, etc.) and an Uninstall button with which you can remove the app. Method 2: This procedure is even easier than the previous one. Search for the Aptoide icon on your home screen or within the applications tray of your smartphone. Once you’ve found it, press on it for a couple of seconds and you’ll soon see several options that appear on the upper part of your screen, and that may vary depending on the Android version that you’re running. One of them is to uninstall the app and it’s usually represented by a waste bin. Just drag the icon to that option to start uninstalling Aptoide. 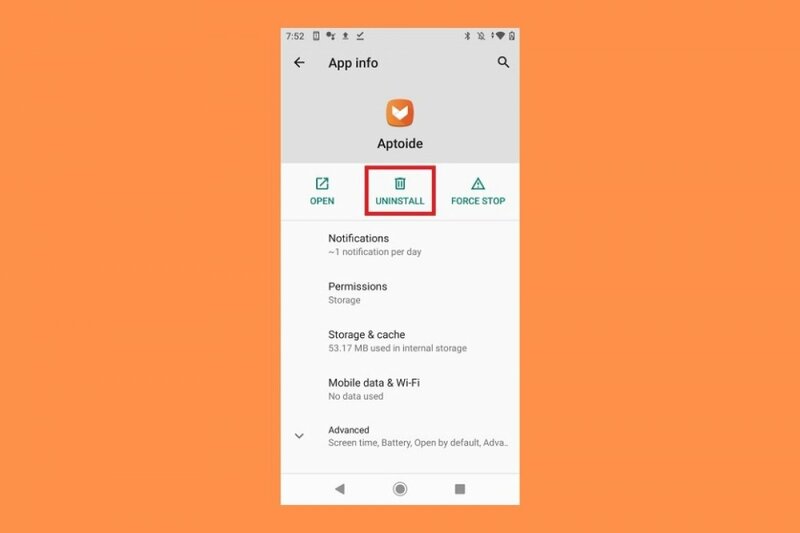 Remember that even if you uninstall an application from your phone, in this case Aptoide, there may be leftovers of junk files associated with its installation that can fill up our phone’s memory. That’s why it’s recommendable to use a cleaner and optimization app now and again to get rid of all these useless files. As you’ve seen, uninstalling Aptoide, the best alternative application store to Google Play, is very simple and carrying out this process is identical to the deletion of any other application installed on your smartphone or tablet.